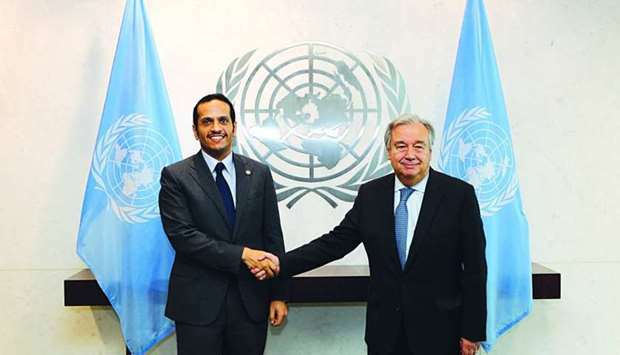 The Foreign Minister HE Sheikh Mohamed bin Abdulrahman al-Thani met with the Secretary-General of the United Nations Antonio Guterres yesterday and discussed with him ways to enhance joint cooperation between Qatar and the UN in all fields of common concern. Sheikh Mohamed briefed the UN Secretary-General on the latest developments in the Gulf crisis and all measures taken by the siege countries against Qatar and their serious violations of international treaties, conventions and laws. He stressed Qatar's keenness on pursuing dialogue as a means to resolve the Gulf crisis and its readiness to sit at the dialogue table along with the siege countries. He said the talks should be based on the principles of respect for international law and the sovereignty of Qatar. "This is the right place where we have to start to seek all our options in order to find a legal solution," said the foreign minister. In a press statement after the meeting, the foreign minister said Qatar will spare no efforts to overcome the violations through the right channels, pointing out that the United Nations was the right platform to start with. He added that Qatar had informed the UN Security Council about the existing violations. "We met with many officials and explained to them how this crisis was based on weak grounds, a hacking which in itself is cyberterrorism against Qatar," he said, adding that the Security Council and the General Assembly would have a special role to play if violations by the siege countries continued. He said blockading countries have not yet responded to the efforts which are aimed at resolving the crisis through dialogue and diplomatic methods. 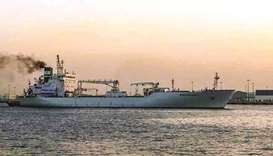 "On the contrary, they are still leading a campaign of fabrications against Qatar and spending money to demonise Doha. He also said that the United Nations is "the right place to face the illegal blockade of Qatar and find a legal solution to the crisis." "Qatar has already stated more than ten times that we want to solve this issue by dialogue, and we are not willing to escalate, and they need to retreat from all their illegal actions," he said. Saudi Arabia, Bahrain, the United Arab Emirates and Egypt cut ties with Qatar on June 5. The four countries accuse Qatar of backing extremism and have imposed sanctions against Doha in what the foreign minister said was a "serious violation of international law". Sheikh Mohamed expressed Qatar's condemnation of the actions taken by the Israeli occupation forces against the Palestinian people in Al Quds as well as its condemnation of any actions that undermine the security of the Al Aqsa Mosque. 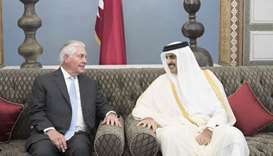 Kuwait has been trying to mediate the Gulf crisis and several top Western diplomats have toured the region to try to defuse the row, including US Secretary of States Rex Tillerson. Later speaking to Al Jazeera, the foreign minister said Qatar will spare no effort to protect its people and lift the illegal measures imposed by the blockading countries. In response to a question , the minister said Qatar is seeking to overcome these measures through all international organisations. The foreign minister also met with the Under-Secretary-General for Political Affairs Jeffrey Feltman and President of the United Nations General Assembly Peter Thomson. He briefed them on developments of the Gulf crisis and all the measures taken by the siege countries against Qatar and how they constitute serious violations of international treaties and conventions as well as international law.